Fertilizing crops with livestock manure nutrients began several millennia ago and is mentioned in the Old Testament of the Bible and other ancient documents. Before the advent of commercial fertilizer production, access to manure was considered necessary for the long-term sustainability of farming systems. Although the use of manure can be sustainable, the time of application is important. Considerable costs to water quality may occur as a result of incorrect application. Agricultural runoff from cropland into waterways is a primary and chronic threat to Iowa’s water quality. High levels of phosphorus and nitrogen in manure can contaminate waterways if manure is spread on frozen, snow-covered or saturated croplands. State law and policy represent Iowa’s commitment — or lack of commitment — to oversight and enforcement of manure application requirements, which has a direct bearing on efficient use of nutrients for agricultural production, water quality, costs to water systems and public health. This report focuses on nutrient runoff pollution from Iowa’s cropland to the Mississippi River system. We will first examine why this is a problem, paying particular attention to how nutrient runoff negatively affects local and regional water sources. We then outline policies and regulations Iowa has in place to address this problem and subsequently look at how the state of Ohio has handled the issue. We conclude with recommendations on policies, staffing and enforcement to protect the future health of our waterways. Photo credit: Iowa Manure Management Action Group, Iowa State University, IMMAG Update March 2014. Manure is an important resource that can be sustainably utilized to enhance crop production. Although Iowa has a large number of confinement operations, the amount of manure produced is not sufficient to meet all soil nutrient needs. Daniel Andersen, assistant professor of agricultural and biosystems engineering at Iowa’s Iowa State University (ISU), has calculated that Iowa crops need much more in nitrogen and phosphorus than manure can supply. In a recent blog he shows that many more acres of corn could be supplied with nutrients from manure. In Iowa, all confinement farms with over 500 animal units are required to submit a manure management plan to the Iowa Department of Natural Resources. Procedures in this plan specify how to calculate the maximum amount of manure that can be applied to a field. Based on the Iowa DNR requirements, the 325,000 tons of nitrogen from manure would be enough for about 3.8 million acres of corn per year. In 2012, there were 13.7 million acres of corn harvested in Iowa and another 9.3 million acres of soybean. This means only about 17 percent of Iowa’s farmable acres received manure in any given year. Since manure can be a cheaper source of nutrients than commercial fertilizer, farmers have an incentive to utilize its value, and also an incentive not to let manure run off cropland and become a problem to Iowa lakes and streams. However, some soil conditions pose special problems for the producer. Unlike normal soil, frozen soil is difficult to penetrate due to water saturation that occurs between freezing and thawing cycles during typical Midwestern winters. When manure is applied to frozen soil its nutrients are not fully absorbed, leaving more manure on top of soil that could run off into nearby waterways during snowmelts and spring rain. Furthermore, the different rates at which manure and soil thaw present another problem: If manure thaws first, water stored in snow packs could melt and carry the unabsorbed manure toward streams. In this case rain is not even necessary for nutrient runoff to occur (Figure 1). However, rain alone can be an additional problem. Applying manure to saturated ground can also reduce utilization of the nutrients to crops and add to pollution, when the nutrients do their job in rivers and lakes and not on farm ground. Thus, timing is paramount to the successful application of manure. ISU research illustrates why the risk of runoff is particularly high when manure is applied in late winter. A two-year study compared the loss of nitrogen from surface runoff across four different manure application times. Its findings show that applying manure in late winter results in an average loss of 41 pounds of nitrogen per acre of corn stubble. This is more than twice the amount of nitrogen lost during early winter applications and more than 10 times the amount lost during spring applications (Table 1). Source: J. Lorimer, 1995, Fate of Nutrients from Liquid Swine Manure Land-Applied in the Winter, Ph.D. dissertation, Iowa State University. These findings are reinforced by other studies. 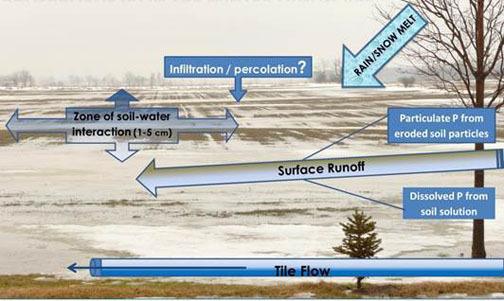 The United States Geological Survey (USGS), using data from the Wisconsin Discovery Farms and Pioneer Farm programs, found “50 percent or more of annual runoff occurred during the frozen-ground period for 16 of 26 farm years of data.” Another study compared the percentage of nutrients transported during rainfall runoff and snowmelt periods and indicated differences in the amount of runoff throughout the snow melt process. During an early winter freeze, applied manure could not penetrate the soil. As a result, during the later stages of melting, greater amounts of soil and manure flowed into the stream. In yet another study conducted at its Reichers Beef site, the University of Wisconsin’s Cooperative Extension reported “runoff from frozen ground and snowmelt conditions contributed 80 percent of the total surface runoff, even though only 10 percent of the annual precipitation occurred during this time.” The study also recorded significantly higher levels of phosphorus loss during late winters between 2003 and 2010 (Figure 2). These results highlight the complex risks associated with winter manure application given the potential for thaw-based runoff in warmer winters and unpredictable rain events in early spring months. Manure runoff has both environmental and economic repercussions. From an environmental standpoint, manure runoff has been linked to fish kills, beach closures, incidents of contaminated drinking water, and hypoxia, a condition that starves water of oxygen and can leave a body of water lifeless as a result, causing ecological, and potentially, economic harm. For farmers, manure runoff often results in a higher fertilizer bill. When manure is lost from runoff it must be replaced by commercial fertilizer. However, while farmers may bear the economic burden of losing manure to runoff, the harmful effects of nutrient pollution are often felt most by communities downstream, reinforcing the fact that the problem is local and regional. One of the most pressing concerns related to manure runoff is its potential to contaminate water. When manure flows into local waterways, especially lakes, it can promote the growth of cyanobacterial algal blooms, which sometimes produce toxins that have forced several beach closures, compromised sources of drinking water, and have caused outbreaks of illness in both animal and human populations. Documented adverse health effects to humans include acute hepatoxicity (liver damage), neurotoxicity, gastrointestinal problems, and a wide range of allergic reactions. Many Iowans were unaware of the dangers of cyanobacteria until 2014, when a water treatment plant in Toledo, Ohio, warned its 500,000 customers not to use water from the tap because algae blooms surrounded water intakes at its Lake Erie source. The catastrophic algal bloom prompted the mayor to declare a state of emergency, as the city was forced to find alternative sources of drinking water since boiling the water did not remove the toxin. As noted in a 2014 Washington Post story about this incident: “And with these algal blooms predicted to worsen in Lake Erie and other lakes and reservoirs — thanks to a mix of global warming, invasive species and pollution — the issue is expected to pop up more often. 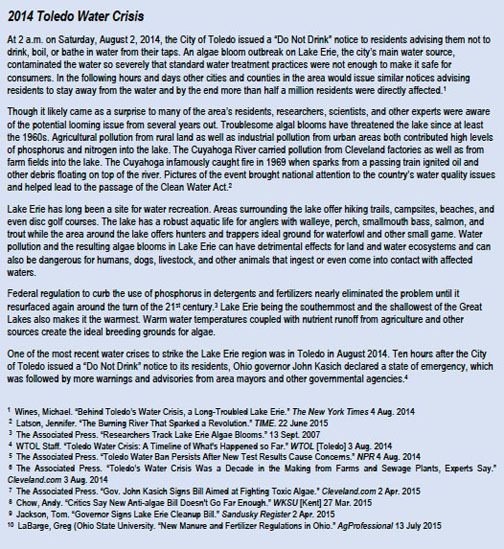 Some believe Toledo could be a tipping point.” However, this is not the first time Ohio has been threatened by harmful algal blooms (HABs). In 2010, excessive HABs caused the closure of Grand Lake St. Marys and forced the state to issue warnings at two Ohio Lake Erie public beaches. Blue-green algae — or cyanobacteria. Recent scientific papers have demonstrated why potentially toxic cyanobacterial blooms may increase in severity. 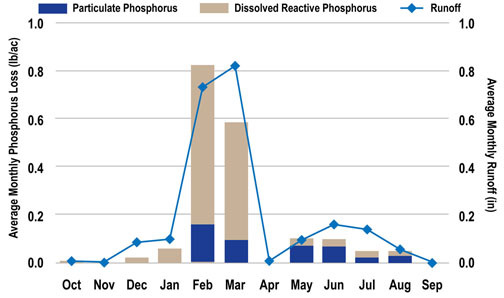 Warmer temperatures and heavy rainfall events with long dry periods in between will lead to acceleration of the eutrophication process that the high levels of nitrogen and phosphorus make possible. The EPA has noted these weather patterns are predicted to occur more frequently as the Midwest climate changes, making inappropriate nutrient application even more of a problem. A 2014 statement by 180 scientists and educators at 38 Iowa colleges and universities states that climate conditions will affect public health in several ways including the increased possibility of cyanobacteria outbreaks. In fact, Iowa already experiences rising levels of cyanobacteria. The state monitors such outbreaks at state-owned beaches. During summer months the Iowa Department of Natural Resources monitors for microcystin, a type of toxin sometimes produced by cyanobacteria, at 38 state-owned beaches. 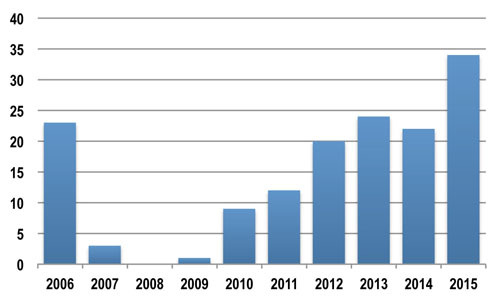 Their results point to major increases over the past few years (Figure 3). The nitrogen contamination from agricultural runoff has also significantly contributed to the rising cost of treating drinking water in Des Moines as regulated by the Safe Water Drinking Act. This has been an ongoing problem for the city of Des Moines, which must periodically operate one of the largest nitrate removal systems in the world at a significant cost to Des Moines citizens. Early in 2015, the Des Moines Water Works (DMWW) Board of Trustees voted unanimously to issue a notice of intent to sue the Board of Supervisors in Sac, Buena Vista and Calhoun counties “in their role as governing authority for 10 drainage districts that are discharging pollutants into the Raccoon River,” which threaten Des Moines’ drinking water. Following the 60-day notice the DMWW followed through and has filed a suit. While the authors acknowledge that runoff from manure applications is not the sole source of nitrate pollution, it is a contributing source, especially when applied during the winter season. Another consequence of nutrient runoff is the creation of the hypoxic region, or “dead zone” as it is also called, located in the northern Gulf of Mexico where the Mississippi River empties. Hypoxia in the Gulf is caused by excess nitrogen and phosphorous delivered by the Mississippi-Atchafalaya river system. 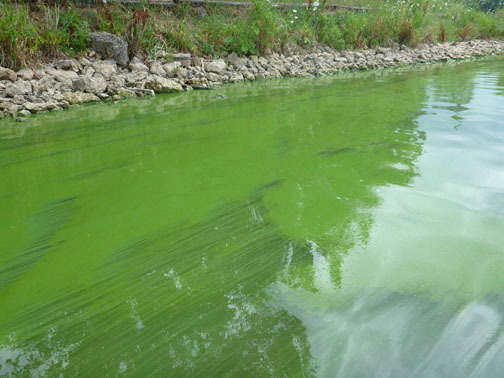 The high levels of nutrients promote the large algal blooms and when the blooms die and decay a high amount of oxygen is consumed, killing fish and other organisms and leaving the area lifeless as a result. The Ohio EPA has stated that 56 percent of the excess nitrates originate from non-point sources (including both manure and commercial fertilizers) above the confluence of the Ohio River and the USDA states, “In the Mississippi River’s drainage basin, animal manure was estimated to contribute 15 percent of the total nitrogen load entering the Gulf of Mexico.” Therefore, by limiting the amount of runoff due to inappropriate manure application, the nutrient load to the hypoxic zone could be significantly reduced. 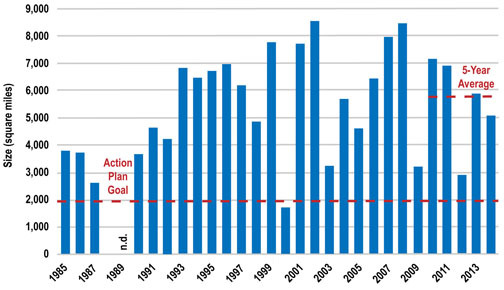 The Mississippi River Gulf of Mexico Watershed Nutrient Task Force’s 1,900 mi2 2001 Action Goal limit compared to the actual five-year average size of the hypoxic zone — 5,600 mi2. To understand the magnitude of winter manure application, we should also examine the source and volume of manure generated in Iowa. All animal feeding operations generate manure. Regulations for these operations are based on the number and type of animals and whether they are confined to a roofed structure or an open feedlot. 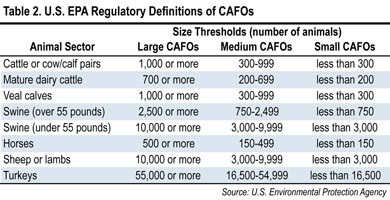 The U.S. Environmental Protection Agency (EPA) classifies facilities based on specific thresholds of the type and number of animals on site (Table 2). Iowa imposes restrictions based on timing and soil conditions. The state has banned the surface application of liquid manure from February 1 to April 1 if the ground is frozen and from December 21 to April 1 if the ground is snow-covered. Research cited above demonstrates that soil conditions are important in determining nutrient loss. Notably, this mandate does not apply to all animal production operations or methods of application. For instance, the law does not apply to dry manure, manure from open feedlots, or liquid manure from fairly large facilities. Even a large facility can apply liquid manure during the specified winter month ban if it is injected into the soil or incorporated on the same date of application. Lastly, several emergency exemptions permit the application of manure, such as natural disasters, unusual weather, as well as equipment and structural failure. Moreover, until recently, DNR allowed insufficient storage as a reason for emergency application, provided that the producer was taking steps to either build more storage or reduce their number of manure-producing animals. Since the winter of 2014-15, insufficient storage is no longer considered an emergency. How are Iowa’s Policies Falling Short? Second, the law fails to include some conditions when manure might be lost, such as saturated ground, to the detriment of producers and the environment. In other words, even if the ground is frozen or snow-covered between the dates set out below [from Dec. 21 (first day of winter) to April 1 for snow-covered ground and from Feb. 1 to April 1 for frozen ground], the liquid manure can be applied without complying with the emergency restrictions if it can be injected or incorporated on the same date, subject to the general requirements discussed previously. The restrictions on liquid manure application on frozen or snow-covered ground apply only to the areas where the ground is frozen or snow-covered. In the areas of a field that do not qualify as frozen or snow-covered, manure may be applied in those areas. Also, the critical factor is the condition of the ground at the time the manure is applied. For example, if the ground is snow-covered early in the day but not later in the day, then manure may be surface applied later in the day without being subject to the emergency restrictions. The same applies to manure applied on ground that becomes snow-covered or frozen after the application. Thus, to ensure compliance with DNR requirements, a producer may want to document the condition of the ground at the time the manure was applied by keeping a detailed log and/or taking photos. The law’s numerous exemptions add to the degree of vagueness and complexity, making it rife for potential abuse or honest mistakes. 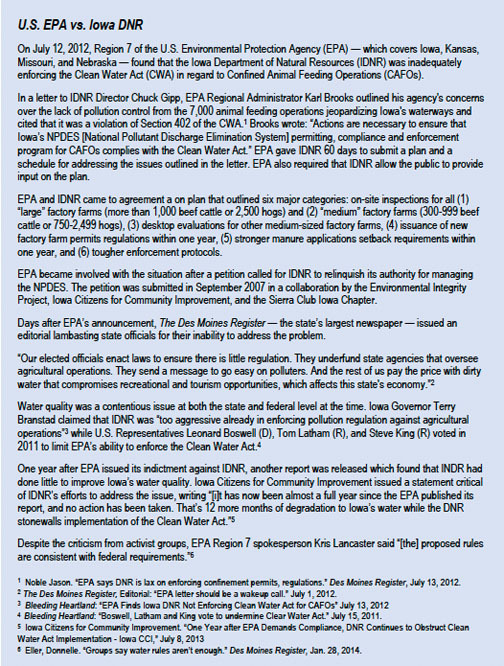 A report by the Environmental Law & Policy Center and the Mississippi River Collaborative entitled, “Cultivating Clean Water: State-Based Regulation of Agricultural Runoff Pollution”, examined specific agricultural non-point source regulations at the state-level to determine which states had effective programs in place. Iowa’s winter manure regulations were criticized for not restricting winter manure application for dry or solid manure, as well as the lack of regulation for smaller operations. Since 2007, the DNR has had a significant reduction in its animal feeding operations staff. To better meet our responsibilities, the DNR needs both an increase in staffing and to reprioritize workloads. Animal feeding operations field staffing gradually increased to a high of 23 by SFY 2004…. Further reductions leave the total of field staff for confinement work at 8.75 full time equivalents. This reduction means that the DNR will not be able to maintain an adequate level of compliance and enforcement activity in confinements. In light of having the highest (least protective) ratio of animal production facilities to staff, Iowa still has some way to go to protect water quality and to help farmers efficiently use nutrient resources. Such a complicated regulation means the few staff members at the DNR will have a tough time doing their job. It is tougher since Iowa law is a “both and” statute. The ground needs to be impermeable and be within the dates specified before manure application is limited. In addition to the decreased number of inspectors, EPA Region 7 pointed out inadequate enforcement of the law citing the low number of manure violations that resulted in citations. The subsequent agreed-to workplan covered this issue as well. Finally, manure is manure, no matter the size of facility. Setting regulations in Iowa only for facilities above 500 animal units is a choice, one which makes Iowa’s law less protective of water quality and less efficient in the use of the manure as a resource. The state of Minnesota is more restrictive. Since 2006 all livestock operations with 300 or more animal units must complete a manure manage plan or have manure spread by a certified commercial applicator to be in compliance with MPCA [Minnesota Pollution Control Agency]. The University of Minnesota Extension document from which the above quote was taken also points out that record keeping and limits to manure application in sensitive areas applies to operations as small as 100 animal units (AU). The 300-AU limit is consistent with the EPA designation for a medium facility shown in Table 2. The state of Ohio also uses size definitions similar to EPA size definitions for levels of restrictions on animal production facilities. Facilities as small as what the EPA would classify as 100 AU will in 2017 be required to comply with applying manure on saturated, snow-covered or frozen ground as will be explained below. To repair deficiencies in the present law on manure applications, Iowa does not have to reinvent the wheel. It simply needs to look to a Midwest neighbor and take action. In 2012, Ohio ranked 10th in the nation for combined crop values of corn, soy, wheat, and nurseries, and inventoried over 52 million livestock animals (including broilers, pullets, turkeys, hogs and pigs). Both Iowa and Ohio have economies that are strongly influenced by livestock production, however recent experience has caused Ohio to go further on limiting manure applications. The experience in Toledo (box above) pushed the state to take manure more seriously in the region of the state that drains into Lake Erie. Bipartisan agreement led the Ohio Senate to pass Senate Bill 1 in 2015 with a unanimous vote. It not only further restricts manure but also commercial fertilizer application on frozen ground in the Western Lake Erie Basin. Application is restricted when soil is snow-covered, frozen or when the top two inches of soil is saturated or when there is a 50 percent chance of rainfall. 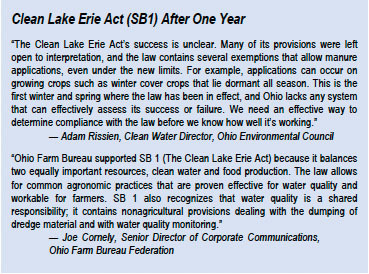 Moreover, the bill requires increased monitoring and testing of phosphorus levels at publicly owned water treatment plants, imposes higher civil penalties for violations, and designated a position at the Ohio EPA to address urban contributions to nutrient runoff. Clearly Ohio’s lawmakers took major steps toward limiting nutrient runoff associated with manure application on unsuitable ground. One of the key components of Ohio’s success was the support from the Ohio Farm Bureau Federation and the Ohio Farmers Union. The Ohio Farm Bureau Federation has stated that it is supportive of “practices that are workable for farmers, apply to a well-defined geography, and include appropriate penalties,” and directed staff to engage with lawmakers and agencies as legislation was developed. In addition to this bill, Ohio’s Governor John Kasich released his 2016-2017 budget. One focus of this budget is protecting the Lake Erie Watershed, in which “aggressively tackling water quality issues” incorporates supporting conservation practices, reducing sediment dumping, and banning manure or fertilizer on frozen and snow-covered or rain-soaked ground in the Western Basin. Additionally, the Ohio Department of Agriculture will require applicators of manure from large CAFOs to obtain a certified Livestock Manager or Agricultural Fertilizer Applicator Certificate. This provision hopefully “helps ensure that applicators practice responsible nutrient management principles.” Presently, Ohio lacks a system to assess if certification translates in better practices. Still, the new law indicates the Governor’s support for better agricultural nutrient management. (3) When the local weather forecast for the application area contains greater than a 50 percent chance of precipitation exceeding one-half inch in a 24 hour period. unless the manure is injected into the ground, incorporated within 24 hours of surface application, applied onto a growing crop, or if in the event of an emergency, individuals should contact their local Soil and Water Conservation District Office. Definitions for what constitutes these unacceptable conditions come from the Ohio Department of Agriculture’s internal guidance and are not part of the law’s regulatory requirements. Therefore the following working definitions are not binding while they are informative. Snow covered soil is when soil, or residue lying on the soil, cannot be seen because of snow cover, or soil covered by one-half inch of ice or more. Frozen soil is ground that is impenetrable because of frozen soil moisture. The restriction is intended to prevent situations where fertilizer or manure is unable to freely infiltrate the soil and therefore would likely run off to surface water. Generally, frozen soil will: 1. Not be easily penetrated by a metal object (such as a knife, screwdriver, or shovel), 2. Not deform to show a visible imprint under downward pressure, and 3. Have a temperature below 32° F.
Saturated soil occurs when all the pore spaces in the soil are filled with water. A soil that has an available water capacity above field capacity will be considered to be saturated. According to the Natural Resource Conservation Service Standard 590 for Ohio, when the available water capacity of a soil is above field capacity, then free water will appear on the surface of the soil when the soil is bounced, kneaded, or squeezed. For a fertilizer or manure application to be considered a violation of the law, the top two inches of the soil would need to be saturated and the application would have been made without incorporation, injection or a growing crop. Growing crops will vary by season. In the summer, a growing crop is any green plant that will be harvested or that was planted as a cover crop. In the winter, a growing crop is any plant that will be harvested or that was planted as a cover crop and that will not winter-kill. Plants in dormancy will be considered growing crops, as long as the plant species typically “greens up” and continues to grow in the spring. For practical purposes, a growing crop has emerged from the ground and provides reasonable ground cover. Injection means placing the fertilizer or manure beneath the soil surface. The applied material is retained by the soil and does not concentrate or pool at or below the soil surface. If fertilizer or manure is injected, then the application is not a violation of the WLEB restrictions. Incorporation is tillage that mixes the fertilizer or manure into the soil to an average minimum depth of four inches and mixes the fertilizer or manure with surface soil so that at least 80 percent of applied material is covered with soil. If surface applied fertilizer or manure is incorporated within 24 hours of application, then the application is not a violation of the WLEB restrictions. Fines can be imposed for major and minor infractions; for a major infraction the penalty is $10,000. In addition, the size of an establishment that is subject to these limits goes far beyond what is required in Iowa. While the initial limits were for large animal facilities effective July 2015, medium facilities (defined as 750 to 2,499 swine that each weigh 55 pounds or more) must meet the requirements in July of 2016. Small facilities (an animal feeding facility that is not a large or medium concentrated animal feeding operation and that is designated by the director as a small concentrated animal feeding operation pursuant to rules) has one additional year to comply. While this report did not look specifically at all Midwest laws it was possible to find the number of regulatory staff in several states. Table 3 describes the number of large and small animal feeding operations in Midwest states and the number of direct staff to enforce rules and regulations. Ohio has a CAFO-to-inspector ratio of 48 to 1. 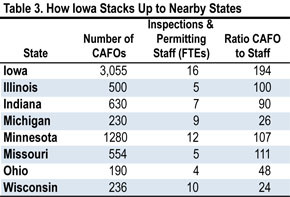 Assuming this level of staff enforcement is adequate, staff members in Iowa must work even harder on enforcement, as their inspection ratios exceed 100 to 1. Iowa stands out because it has so few staff relative to the number of facilities needing oversight. Confusing winter manure application regulations exacerbate the challenge of enforcement, as Iowa’s inspectors spend extra time determining the state of the land and the date when responding to complaints from neighbors who may be unclear about the many exceptions to Iowa’s ban. •	An outright ban on manure application in liquid form from medium and large animal production facilities when the ground is frozen or snow-covered, when the top two inches are saturated from precipitation or when weather is expected that will be detrimental to the environment and to the utilization of the manure. •	Ample “boots on the ground” enforcement capabilities with long-term funding allocated to maintaining adequate staffing. •	•	Immediate adoption of restrictions on all operations at 300 animal units (AU) or more for manure application during unfavorable soil conditions. •	Progress toward placing application restrictions on all facilities above 100 AU in size. To maximize the benefits of manure for farmers, the environment, and communities downstream, Iowa must address the interaction between manure and soil that can absorb it. Doing so will require implementing a ban when the potential for runoff is greatest. Finally, we must eliminate the many exceptions that exist within the current statute. Manure is manure, regardless of the size of facility. Ohio’s law is stronger than Iowa’s because the state found through experience that manure can be a major problem. Rather than being reactive, Iowa should be proactive. Iowa does not have to wait for one of our cities to lose its drinking water before we act. Minnesota Environmental Quality Board. 1999. Generic Environmental Impact Statement of Agriculture: A summary of the Literature Related to Manure and Crop Nutrients. Page J-9. Heffernan, A., Galluzzo, T., Hoyer, Will. “Solution to Pollution: It Starts on the Farm,” The Iowa Policy Project. September 2010. Andersen, Daniel. How much manure is there in Iowa? The Manure Scoop. ISU Extension, blog post from October 6, 2014. Owens, Bonta, Shipitalo, and Rogers. Effects of Winter Manure Application in Ohio on the Quality of Surface Runoff American Society of Agronomy, Crop Science Society of America. January 2011. Reichwaldt, E.S., Ghadouani, A. “Effects of Rainfall Patterns on Toxic Cyanobacterial Blooms in a Changing Climate: Between Simplistic Scenarios and Complex Dynamics.” Water Res., 46 (5). pp. 1372-1393. 2012. Paerl, H.W., Huisman, J. “Blooms Like it Hot.” Science, 320, pp. 57-58. 2008. Personal communication with DNR staff person Mary Skopec, 10/21/2014. Ribaudo M, Gollehon N, Aillery M,et al. Manure Management for Water Quality: Costs to Animal Feeding Operations of Applying Manure Nutrients to Land. Washington, DC: U.S. Department of Agriculture, Economic Research Service; June 2003. Iowa Department of Natural Resources. “IDNR AFO Workplan Annual Report. August 2015. Iowa Department of Natural Resources. “Manure on Frozen & Snow-Covered ground,” p.3, 2010. Iowa Department of Natural Resources. “Manure on Frozen & Snow-Covered Ground,” p.5, 2010. LaBarge, Greg. Understanding Regulation, Definition, Noncompliance Pentalties, On Fertilizer And Manure Application In Ohio Wleb. C.OCRLN Newsletter 2016-3. Ohio State University Extension. David Osterberg is co-founder of the Iowa Policy Project who specializes in research on environment and energy issues. A former Iowa state representative who served when the REAP program was passed, Osterberg holds an M.S. in water resources management and another in agricultural economics from the University of Wisconsin-Madison. He is a professor in the Department of Occupational and Environmental Health at the University of Iowa. Nick Fetty is a master’s student in the University of Iowa School of Journalism and Mass Communication. He serves as a Graduate Assistant for the UI’s Center for Global and Regional Environmental Research and writes about environmental news and research in Iowa, particularly in regard to agriculture, water quality, and wind energy. He holds a bachelor’s degree in journalism from the University of Iowa and is a former reporter for the Iowa City Press-Citizen. Nathan Wong served as a graduate student intern with IPP from the University of Iowa School of Urban and Regional Planning. His focus is in economic development and housing and community development. He holds a bachelor's degree in sociology from the University of California, San Diego. In addition, we want to acknowledge the editorial assistance of Nathan Shepherd and Sara Conrad of Iowa Policy Project staff. We gratefully acknowledge generous funding support provided by the McKnight Foundation and the Fred and Charlotte Hubbell Foundation. Policy recommendations are solely the perspective of the authors and the Iowa Policy Project.